This blog post was authored by Martha Teiko Teye and originally published at http://teyemartha.pythonanywhere.com/ . 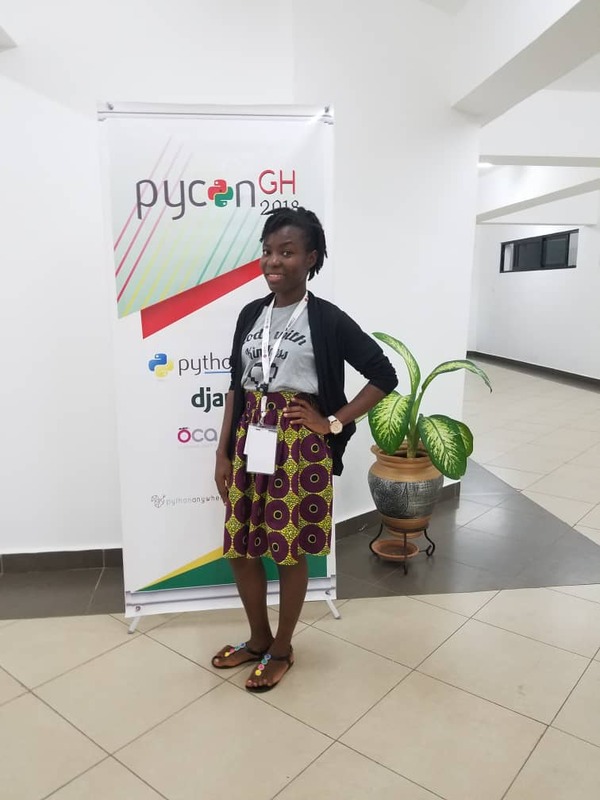 The first ever Python Conference (PyCon Ghana) 2018 was to bring together Pythonistas to converge under one roof to meet, interact, network to share ideas and experiences amongst fellow Pythonistas. Conferences are a great avenue to learn new trends. It has been less than a year since I decided to study python. I was taking Udacity's Front-end Web Development Nano Degree Program at that time whilst still in school; this wasn't an easy task. I wanted to combine my knowledge in front end and python because python has gained much popularity. I know to most beginners and even some experts, this question has been a whole debate. Before reading further, ponder on the number of times this question came up in your journey to learn programming. I had the perfect answer to satisfy my curiosity as I also used to think and read more to know which programming language was the best. After reasoning through different schools of thought, Daniele Procida during his talk at the conference said this: "Explore the language you are currently studying or using to make it the best." This statement seemed arguable at first but I realized that in chasing after the best programming languages, one might study as many languages as possible and would not settle for or become an expert in a particular one. That could be harmful as a programmer since it would be a "jack of all trades, master of none" game. THINK THROUGH!!! "Don't be afraid to fail or be wrong-learning how to learn" ~ Gerald Pharin. Do not let anyone tell you to be an expert before you get useful. I started volunteering after my first year in programming. Volunteering and giving back to the society is very important as it helps you study more and improves your skills. The little you know is enough if it solved a problem. Therefore, when you succeed, teach and impact lives. Key Skills in Becoming a Data Scientist.